Where does knowledge begin, and how does it become rooted and foundation for perceiving reality. We are born as a sack of cells wrapped in a stranger’s womb. Cells divide. Bones, sinew, and skin seem to appear from nowhere. On the outside, we become labeled as that "it", a parasite growing in the gut of a stranger. Tossing off of the host’s hormonal and dietary balance. Destroying ability to participate in society, and acting as a new cause for sympathy. One of the questions I remember asking in my Into to Philosophy course regarding the rationalist vs. empiricist debate that plagued early philosophers was: Ok, so as far as this punk is concerned the stuff which makes up our dreams is rooted in our experiences, what do babies dream of? In The Ring, a severally traumatized Samara (Daveigh Chase) ) inscribes the last moments of her tragic life onto a VHS tape. If the tape is watched, the viewer receives a phone call that says they are going to die in 7 days. What transpires over the next three days are a blurring of the viewer’s reality as they transgress reality into Samara last moments of life. The creepy tape falls into the hands of the absent-minded single mother Rachel (Naomi Watts). Rachel discovered the tape as she is investigating the death of her niece. After watching the tape, she receives a phone call telling her she is going to die. Rachel, of course, doesn't want to die, and half believes the reality of the tape, until an image from the tape, start materializing their way into her reality. 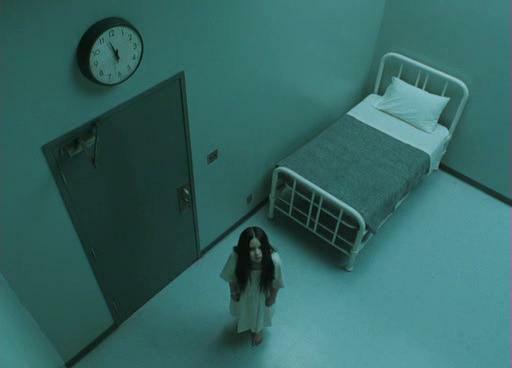 What The Ring provides is a way to experience a reversion it to the psychotic-like dream space of an infant. Where their early universe is indistinguishable from their dreams. A world full of contextualized images, sounds, and experiences. After Rachel watches the film she is annoyed about the fragmentation and seeks to conjoin the disjointed by contextualizing each element of the VHS tape. Simultaneously, Samara's desire is structuring Rachel's journey towards making sense out of the tape, destabilizing and replacing her lived experience. Is this not the same intrusion on an infant's reality that parents play? An infant is seeking to create meaning out of the seemly irregular whims of the baby. Crying without obvious purpose, the parent checks the diaper and seeks to diagnose the need. On the other side, the baby isn't grounded in reason, and experience is limited to the moments where crying is related to feeding. The baby's cry isn't there to conform or reassure the parental narrative, but acts with a radical indifference. The bonding between a parent and child is not empirical or rational, it is biochemical, and only empirical and rational in so far as a parent conforms intangibles into a script. There is a sense that babies learn to dream as they become integrated into the symbolic order. The infant grows up into a toddler and learns a couple words, and is able to cognitively and verbally name objects in their universe. These objects permeate the memory and become the stuff of which a child is able to be begin developing an identity, by contextualizing herself among other objects and things in the world. The experience is almost imperceptible to the child, gradual, yet punctuated with adaptive milestones. First words and first steps are a conquering of the child's symbolic and spatial existence. By conforming to the parents' desire to form into a childlike thing, the child finds footing indifference, and a new space where identity and individuation can be fought out. Out of this fight, the child becomes its subjectivity via a compulsion to become forcing its way into a shared symbolic space.